The Tigers lost all four of their matches during the Towson Invitational this weekend at SECU Arena. Ohio State swept Towson 3-0, racking up 25 points in all three sets on Saturday. The Buckeyes had two freshman, Vanja Bukilic and Mia Grunze, combine for a total of 27 kills. Bukilic had 15 kills during the competition. The Tigers also had a pair of freshmen make an impact as freshman Emily Jarome recorded 11 kills and freshman Fay Bakodimou had eight kills in her first career set start. Towson fell 3-2 against the University of Missouri on Friday evening. Missouri won the first two sets, but Towson forced a fifth set after winning the third and fourth sets. Despite a valiant effort by the Tigers, Missouri picked up the victory after a 15-10 win in the final set. Long Beach State University swept Towson 3-0 on Friday as well. The two teams tied twice in the first set at 14 and 19 points. LBSU went on to score six times while the home team could only muster one point. The second set was close as LBSU won 26-24 due to a Towson block error. Towson fell 25-23 in the final set of the match. “Well you know there were five teams in the tournament this weekend and two Power 5 programs didn’t want to play Long Beach because they thought they were a bit of sleeping giant, but we’re going to play everyone that comes into our venue so competition is competition and hopefully it only gets us better,” Metil said. Princeton University defeated Towson 3-2 on Thursday evening. Towson won the first and third sets while Princeton was victorious in the second and fourth sets, forcing a fifth set. Princeton secured the match after winning the fifth set 15-7. 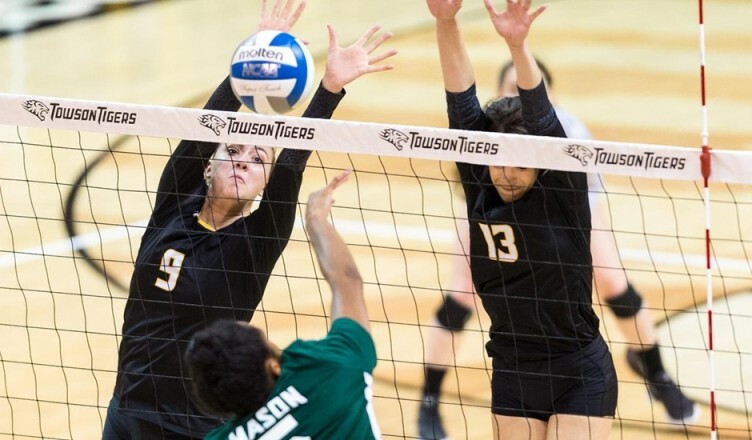 Towson swept the University of Miami and Xavier University 3-0, but suffered a 3-0 loss of its own against Arizona State University in the Puerto Rico Clasico between Aug. 31 and Sept. 2. Next, Towson will host the Tiger Invitational at SECU Arena. Competition begins on Sept. 14 and features matchups with Ball State, La Salle and UMBC.